In a move that probably shouldn’t have surprised anyone, LA’s self-proclaimed environmentalist councilmember has called for a temporary ban on dockless e-scooters. Yes, Paul Koretz, the councilmember who singlehandedly blocked desperately needed bike lanes on Westwood Blvd — as well as on other major corridors throughout the Westside — has taken action to force people of their e-scooters and back into their cars, rather than allowing a viable first mile/last mile solution to take root. This is the same councilman who has called for a Climate Emergency Mobilization Department. Yet can’t seem to see the logical disconnect in fighting alternative forms of transportation while paying lip service to climate change. Then again, he doesn’t seem to see any problem with blocking increased density, either. Evidently, he’s all for emergency action to address climate change, as long as it’s in someone else’s district. Never mind that, as someone else pointed out, blocking bike lanes is just climate change denial in action. Then there’s this disconnect, from the report by KFI radio. As for the public’s reaction, Koretz said he believed most residents want the scooters off the streets. He said his office has receive hundreds of complaints about them in recent weeks. Yes, that is the scientific way to gauge public opinion, especially since people who support the scooters aren’t likely to call to say so without some compelling reason. Like a stupid proposal to ban them, for instance. And how is it that “hundreds of complaints” somehow outweighs thousands of users — by his own observation? As for Koretz’ “better safe than sorry” concerns, there’s this from the Hollywood Reporter’s overview of the response, legal and otherwise, to e-scooters in the LA area. Scooters have shown to pose safety hazards while operational and parked. 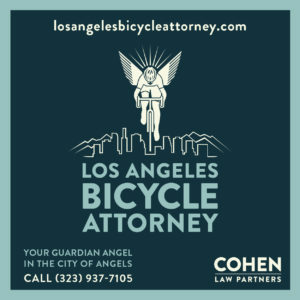 According to injury attorney Catherine Lerer of L.A.’s McGee Lerer & Associates, who has written extensively about electric scooters, the top two seen in her office are people hurt when a scooter malfunctions — when a brake line is cut by disgruntled L.A. residents, for instance, or the scooter’s main post collapses — and pedestrians tripping over the scooters. “I’ve gotten calls from elderly people exiting businesses…people leave them right outside the front door,” Lerer notes. Doesn’t exactly sound like a disaster in the making. Especially when one of the leading causes of injuries is sabotage by scooter-hating NIMBY terrorists. The proposal was seconded by San Fernando Valley Councilmember Mitch Englander, who has also proposed a ban on dockless bikeshare until the city can work out a permitting process. This follows the misguided bans on e-scooters in West Hollywood and Beverly Hills; the latter banning even riding bikeshare bikes or e-scooters through the city, which most likely violates state law. Of course, this kind of hysteria about a new form of transportation is nothing new. And something tells me Koretz would have been one of the first to call for a ban on bicycles had he lived in the 1890s. Although he probably would have been fine with the Model T chasing everyone else off the roads. Of course, Los Angeles could take a more rational approach, like working with Lime and Bird to address any issues while they work the bugs out, as Culver City and Long Beach are doing. But that would make too much sense. Especially for an environmentalist who seems determined to keep Angelenos in their smog and greenhouse gas-belching cars. As long as we’re talking about e-scooters and dockless bikeshare, let’s look at a few more stories on the subject. Curbed offers everything you need to know about renting e-scooters and dockless bikeshare in Los Angeles. While you still can, that is. When a Portland-area website went fishing for complaints about e-scooters, what they got were complaints about cars. And a St. Louis website gives Lime scooters a test ride, and comes back with 13 things they learned. Including that they’re fun as, well, you get the idea. Life is cheap in British Columbia, where a driver gets just 45 days behind bars for killing a van driver while speeding, tailgating and driving recklessly — despite receiving 40 tickets over the last 20 years. Just two more examples of authorities keeping dangerous drivers on the road until it’s too late. More on the American couple killed in a terrorist attack in Tajikistan on Sunday, who had quit their jobs to bike around the world. The couple from Washington, DC had written about their trip on a blog that sadly will never be finished. And authorities blamed the attack on members of the blacklisted Islamic Renaissance Party of Tajikistan. As we noted last week, fresh green bike lanes are finally going down on Santa Monica Blvd in the former Biking Black Hole of Beverly Hills, which had fought the lanes for nearly a decade before surprisingly embracing them last year. 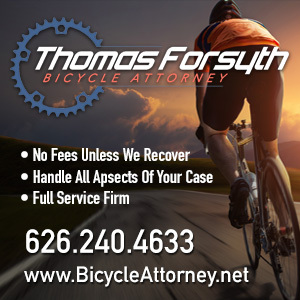 Today Santa Clarita sheriff’s deputies will step up enforcement of traffic violations that put bicyclists and pedestrians at risk, regardless of who commits them. So ride to the letter of the law until you leave their jurisdiction. A Cambrian man accidentally became the first bike rider to travel Highway 1 in Big Sur after it reopened last month. San Francisco approves plans for a curb-protected bike lane the promises to be the safest in the city. Sad news from Del Norte County, where the CHP is looking for a hit-and-run driver who killed a woman as she rode her bike; the victim wasn’t carrying ID and still hasn’t been identified. One more reminder to always carry some form of identification when you ride; I never leave home without my RoadID, which doubles as a medic alert bracelet. A writer for Forbes says cities must take advantage of the opportunities presented by bikeshare. Bloomberg says Uber and Lyft may not be the solution to traffic congestion, but they’re probably not the cause, either. Bicycling profiles BMX star Nigel Sylvester, saying the “rebellious superstar is breaking all the rules,” and doesn’t need your permission, thank you. A writer for Fox News blames “big-spending liberals” for pushing Seattle bike lane and streetcar projects that have been plagued with cost overruns. A Washington writer gets a detailed education in why many bicyclists prefer to ride on the highway, when there’s a perfectly good bike path nearby. Which should be required reading for planners before they’re allowed to design any offroad path. Evidently, Los Angeles isn’t the only city where councilmembers have the power to block bike lanes. A Chicago bike rider was killed when he was doored on a street that was supposed to have a protected bike lane, which was halted by the local alderman. After Ofo pulled out of White Plains NY, they donated over 100 bike for use by low income families. An Albany NY TV station raises concerns about the structural integrity of an old railroad bridge that now used by over “200,000 bike riders, joggers and dog walkers” every year. Charlotte NC is planning its first two-way, protected cycle track. Curbed looks at 14 gorgeous carfree cities around the world. Anyone one of which I’m just about ready to move to. Although bike riding on the Venice canals might be a bit of a challenge. No surprise here, as a study shows the noxious fumes in London’s air disappeared during the annual carfree Ride London event. A British lawyer who calls himself Mr. Loophole suggests revising the country’s traffic laws, including requiring all bike riders to pass a proficiency test, and have their bicycles inspected annually for safety violations (aka an MoT, or Ministry of Transport exam). Talk about lessons not learned. Bike Biz reprints a speech in the British parliament that calls for a revival of bicycling in the national interest — which was given sixty years ago. And clearly not acted on. Egyptians are being encouraged to leave their cars behind in an effort to spread bicycle culture throughout the country. Shimano has apparently overcome the losses from the factory fire in Japan earlier this year, with sales up 6.8%. Forbes calls bicycle racing the best sport to combine spectating and active participation. A French newspaper calls for a budget cap for pro cycling teams following Team Sky’s dominating performance in the Tour de France; the president of cycling’s governing body calls for limiting teams to a maximum of six riders instead. After successful surgery to repair a fractured vertebrae suffered during the Tour, Vincenzo Nibali hopes to return in time for the Vuelta a España later this month. VeloNews talks with a sports psychologist about whether the abuse Team Sky riders suffered from fans during the Tour had any effect. Apparently not, since they led most of the way and placed two riders on the podium; cutting back on salbutamol probably had a bigger effect on Chris Froome. Speaking of VeloNews, the magazine also talks with the head of the Dimension Data team about his efforts to build an African team; while several African riders have competed on the WorldTour with the team, no black African has yet won a stage at the highest levels. And completing our VeloNews trilogy, the magazine offers a beautiful photo essay of the Tour de France from the Pyrenees to Paris. A 60-year old Australian woman won the masters mountain bike world championships just one day after suffering a major crash. Evidently, the more bikes change, the more they look the same. Doing the Tour de France without a bicycle. And sometimes, doing the right thing gets rewarded. As bike riders, we don’t hesitate to criticize LADOT when its called for. But let’s take a moment to offer the the city’s Department of Transportation our sympathy and prayers on the death last week of LADOT Traffic Officer Gregory Park, who became collateral damage in a traffic collision as he was writing a parking ticket in Van Nuys. I hope you’ll join me in sending our condolences to his family, friends and co-workers. And remember that we’re not the only ones at risk on the streets. Yesterday we mentioned two American bike tourists who killed in Tajikistan, along with riders from Switzerland and the Netherlands. Today we learned that the four were victims of a terrorist attack, as Islamic State claimed credit for the killings. They were run down with a car, then attacked with knives. Three others in the group were wounded. Authorities later killed two suspects and arrested three others, as well as recovering a car that may have been used in the attack. Another three suspects were “rendered harmless,” though it was unclear what was meant by that. Although I’m sure we can guess. Thanks to Richard Risemberg for the heads-up. Hats off to new LA Laker LeBron James for opening a new Akron, Ohio school for at-risk kids. The goal is to help kids who are lagging behind in school and struggling at home with accelerated learning and help combating difficulties outside of the classroom. LeBron James often credits his bicycle as a huge factor in his childhood that gave him an escape from dangerous parts of his neighborhood and the freedom to explore — every student will receive a bicycle when they arrive. I’ve never been a big basketball fan, but I’m starting to like this guy. 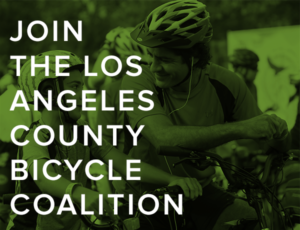 The LACBC’s monthly Sunday Funday bike ride will explore South LA and the Watts Towers this Sunday. Santa Monica approved a $5 million plan to quintuple the amount of green bike lanes in the city, as well as providing more secure bike parking and video bike recognition systems at red lights. Wheel Tales is offering three community bike adventures, including four day rides along California’s Central Coast or a Santa Cruz Challenge. Charles Hudak sends word that Ofo is not leaving Southern California, let alone the US, despite emails to that effect that went out Friday in Los Angeles and San Diego. 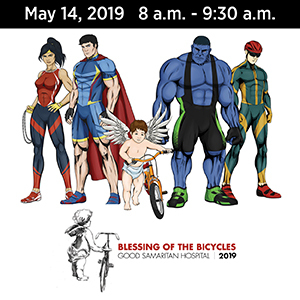 Speaking of San Diego, it’s less than a month away from Bike the Bay, your once-a-year chance to ride the city’s iconic San Diego Coronado Bay Bridge and cruise around the San Diego Bay. Video shows a bike rider nearly run down on the Bay Area’s Mt. Diablo, as a tour bus drifts onto the wrong side of the road as the rider approaches. Deontae Bush, the bike rider killed in an Oakland collision Friday night, was just pushing off from the curb after giving a woman money for bus fare when he was struck and killed. Oh, hell no. A new bill in Congress would tax transit agencies, bicycle tires and ebike batteries to pay for the growing Highway Fund deficit instead of raising the gas tax, which hasn’t been increased since 1993. In other words, they want bike riders and transit users to subsidize drivers even more than we already do. Bloomberg says Trump’s tariffs on Chinese goods will make virtually every bicycle sold in the US more expensive, at a time when local bike shops are already struggling to survive. Pacific Standard talks with Adonia Lugo about building a more inclusive bike advocacy movement. Good piece, as CNN’s Wisdom Project considers the mindfulness and zen of bicycling. I’ve long considered bike riding a form of moving meditation. An economist riding across the US concludes that bicycling is the third most dangerous sport, no matter how you calculate it. Police in Houston release new video of the suspect in the fatal shooting of famed cardiologist Dr. Mark Hausknecht as he rode his bike to work. No bias here. After a Tulsa bicyclist was killed and another rider injured when they were run down by a pickup driver, a local TV station blames the confusing bike lanes that they weren’t using, which aren’t on the street they were riding on. Last week’s Chicago Critical Mass ended in front of city’s police headquarters to protest the department’s policy of zero-tolerance bike enforcement in black and brown communities. Bicycling to Rhode Island’s famed Newport Folk Festival reached an all-time high, as over 1,800 people left their cars at home each day to rode to the festival. New York could have a black, bike-riding mayor in three years if the Brooklyn borough president has his way. Gothamist says private cars are increasingly pointless as e-moped sharing comes to New York. Meanwhile, dockless ped-assist e-bikesharing is unveiled in the Big Apple, which just legalized such lower-speed ebikes. A Florida letter writer complains about all those inconsiderate bicyclists who park their cars at the beach to ride their bikes, as opposed to all those very considerate drivers who park at the beach to just go to the beach. A new campaign is underway to get bicycle mayors appointed for over 100 cities around the world by 2020. Although the Los Angeles bicycle mayor would probably be too busy running for bicycle president to actually get anything done. Caught on video: A clumsy Montreal thief dismantles a traffic sign to steal a bicycle, prompting the mayor to call for more bike parking. And this is why you never lock your bike to a sign post. A new Toronto app allows riders to report problems with bike parking, including the need for more. Meanwhile, a new survey shows 80% of Toronto residents support building protected bike lanes, including 75% of drivers. Thanks to Norm Bradwell for the link. As we mentioned last week, London’s new Vision Zero plan would eliminate traffic deaths by 2041. They might actually succeed, after cutting traffic fatalities nearly 50% in just the last ten years, and with an actual plan to get them the rest of the way. After a British woman was knocked unconscious in a crash with another bicyclist, she woke up unable to remember how to speak English. A driver in the UK gets eight years for a drunken hit-and-run that took the life of a local chef as he biked home. Great Britain is looking for ideas on how e-cargo bikes and electric transport vans can make more last mile deliveries. Celebrate Geraint Thomas’ victory in the Tour de France with five of the best bicycling routes in Wales. According to a Swiss study, riding an ebike less than four miles a day, at least three times a week for four weeks, is enough to start getting back into shape. Meanwhile, a writer for Bike Radar says like it or not, ebikes are here to stay, and that’s a good thing. Korea will mandate the use of bike helmets at the end of September, though hygiene-wary bicyclists question the wisdom of shared helmets for bikeshare. Cycling Magazine recounts five OMG moments from the Tour de France. Four of which are exactly the ones I’d list. Cycling Weekly goes back to last winter to examine how Geraint Thomas won the Tour, while a Welsh columnist says maybe Thomas should run for first minister of Wales. Nice piece from NPR about Texan Lawson Craddock’s last place finish in the Tour de France, riding almost all 2,082 miles with a broken shoulder blade. Needless to say, it was not easy on his mom. In a sign of the times, officials examined bikes for motor doping over 3,000 times during the three week tour. Ethiopian cyclist Tsgabu Grmay’s determination and thick skin has made him a two-time competitor in the Tour de France. A writer for VeloNews decides to enter the Leadville 100 race on a mountain bike as old as he is. Writing in Bicycling, a former racer recounts the broken promise that cost him the 2001 U-23 championship, which had haunted him ever since. Biking home after too many biers could get you a big fine. Apparently, asking a cop why he’s pulling over bicyclists on a charity ride can also get expensive. And Cincinnati unexpectedly gets the Bird.